For the month of February, Brown Paper Packages and I are hosting Pattern Review Month. For the next 28 days we'll be sewing pdf and vintage patterns and having lots of giveaways. First up: The Somerset Hoodie by Mamastellato. Look at the nice picture on the pattern. Now, look at my hoodie with the extraneous neck piece on the left. I'm trying to convince her to hold up the limp piece while scarfing those gummy bears. It's a no-go. So that you won't all know think I'm a complete idiot, I soooo redeemed myself on my second attempt at this shirt. I could easily see where I went wrong the first time. I guess that's why you're supposed to make a muslin first. What I liked: it is fabric economical (I used only a half metre plus trim fabric for a size 4T), and was quick to make. 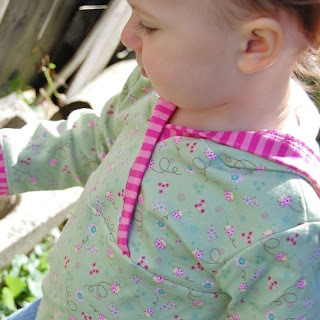 The instructions were clear with lots of photographs, plus some tips for sewing with knits. Anything I would change: I lined the hood to give it more weight and to hide the interior hood seam. Where to find the pattern: Mamastellato's Etsy shop. The pants in Attempt #1 are Monkey Pants from this pdf pattern by danslalune which I bought over a year ago and is still available in her shop from Japan. The big bum is a fabulous cloth-diaper accomodater. The pattern itself was short and simple. Nice hoodie. is that a Toopie and Binou puzzle on the floor? I recently fused the interfacing to the wrong side of a shirt I made for my husband. Yea I'm such a genius. You aren't the only one. Love the hoodie though! That black and white one turned out super cute. I've got the pattern cut out and have been thinking of tackling it in the next few days. Your purple one has be a bit nervous -- any tips to help avoid what happened there? Greatjencreations, you won't have any problem. I was sewing late at night and not paying attention. I also used the hem strip (which is shorter) instead of the hood trim strip. I'm sure you won't do that! Love the black & white one. I've sewn this one and love the results. I love the knit you used in your second hoodie! Where did you find that Cynthia? Wait, don't tell me- I have no business buying fabric! I like this pattern too. The monkey bum pants are cute as well! The top is adorable! I'd love to make it. Thanks for featuring it. You're pants are cute for little ones too. That top is adorable! I have yet to venture into tops. So far I have done dresses and skirts for my daughter. With the pattern reviews happening, you both are giving me inspiration to dust off some of the patterns (or print them off in they are e-patterns) and give them a try! !